Here's a little ditty that I shot yesterday while the gals were visiting the studio. Please excuse my very excited dog, Jack. I think he was jealous that I wasn't filming him or maybe he wanted to paint a pot, too? We may never know! I Should Be Making Pots! So much for my 12x12 this morning. Instead, I'm grinning and marveling at my wondrous new Apple Cinema Display! Finally I can take the old Compaq VGA (circa 1998) to the local second hand store! The color, the brightness, and the wide screen on this 20" monitor is kind of freaking me out! I realize now what I've been missing. I may have to go back and recalibrate all of the images on the blog for the last couple of years (since I inherited this awesome Mac G5). The Compaq VGA monitor has been fine, but I always had a hunch that the color wasn't quite right. But I guess you make do with what you have, right? Well I might as well catch you up in studio news, while you've taken the time to visit. I finally planned the firings for the year and coordinated dates of shows, exhibits, etc with firing dates! I also went ahead and penciled in 2012 as well, since there are already shows I've committed to for next year. I made a dozen more plates and bowls in Matt and Dave's Porcelain (for the People) Sunday. The weather was gorgeous and it was the first time in a good while that I wasn't bothered when the girls came into the shop without closing the door! I even let the wood stove take the day off! I glazed the earthenware pots for the Montessori School Literary Tea Project. 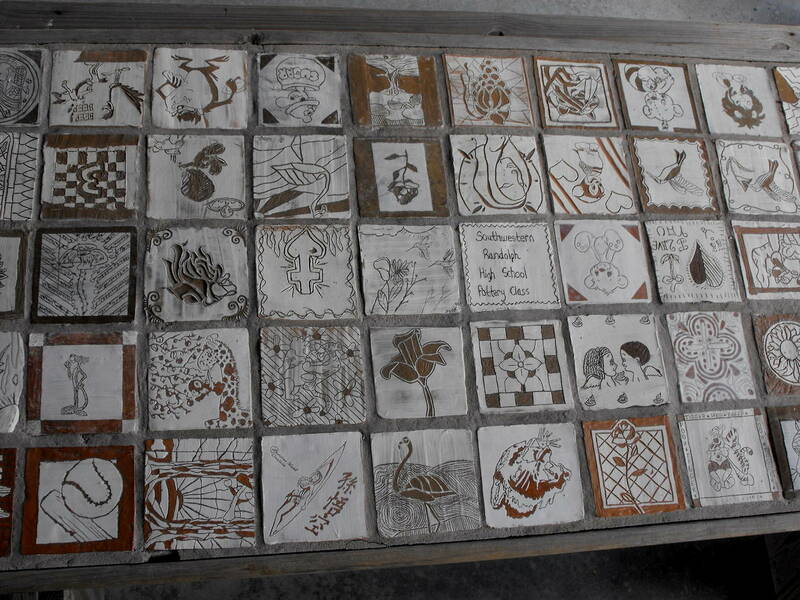 I should get them into the kiln shortly and glaze them up! Today, I also plan on doing some painting of the porcelain bisque for the upcoming cone 7 glaze firings in the revamped L & L eKiln! Very exciting! 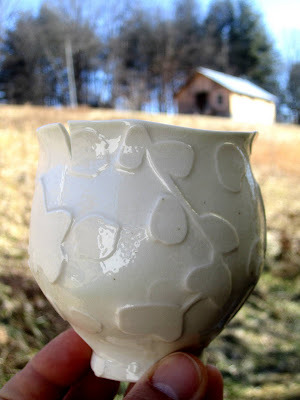 I'm going to do some glaze tests to experiment with my wood kiln glazes at that temperature, too. Well, I'd better get with it and get up to the shop . 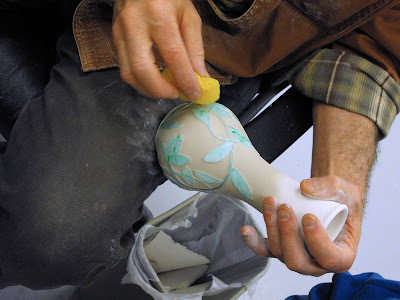 Here is a another picture from our Sunday in paradise where we see the heir to my brushe collection painting a tea cup! Have a great week, be productive, Love what you do, and take a chance! I wanted to show it here as a reference to the hydro-abrasion (a Michael Sherrill term) that I mentioned the other day (see video). 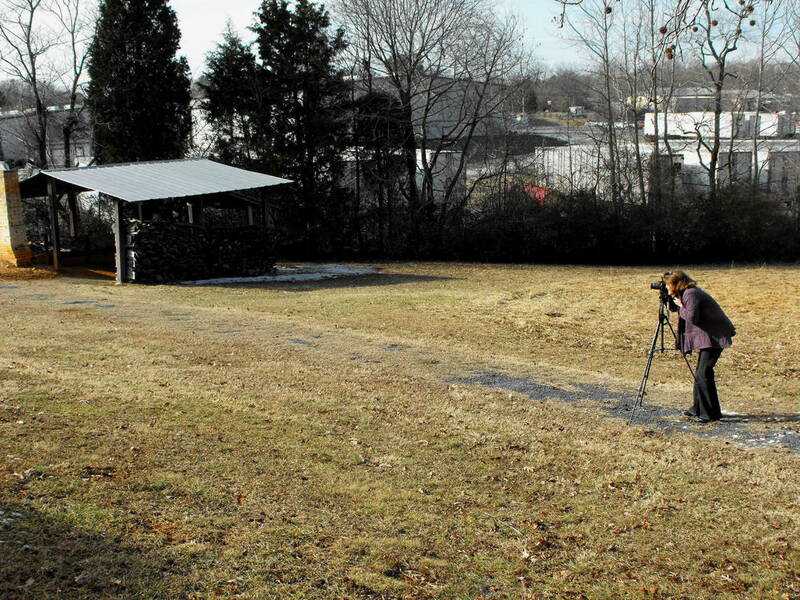 I can't remember if I have talked about this particular phase of my making career, but it all happened back in 1999 when my studio mate at the Barns at Penland, Shawn Ireland was moving out and was passing off stuff he didn't need or want as he was packing up. He came in and held out a quart can of Shellac and asked me if I wanted it. I didn't know, at the time, what the hell I would do with a can of shellac. I didn't know the work of Jim Gottuso yet, after all! I said yes just to help the guy out, you know how it is for hoarders, it was like a small intervention. ;-) Actually Shawn was very neat. So, I went to the list serve (clay-arts?) and looked up some possible reasons Shawn would have a can of shellac in his studio. I knew shellac was used for woodworking projects. Shawn was also painting on canvas towards the end of his residency, and still makes wonderful paintings, so that was possibility. But lo and behold, there was a thread on the list serve that very day on using shellac as a resist! And so began hours of painting and sponging away the porcelain to get these translucent effects on the porcelain. 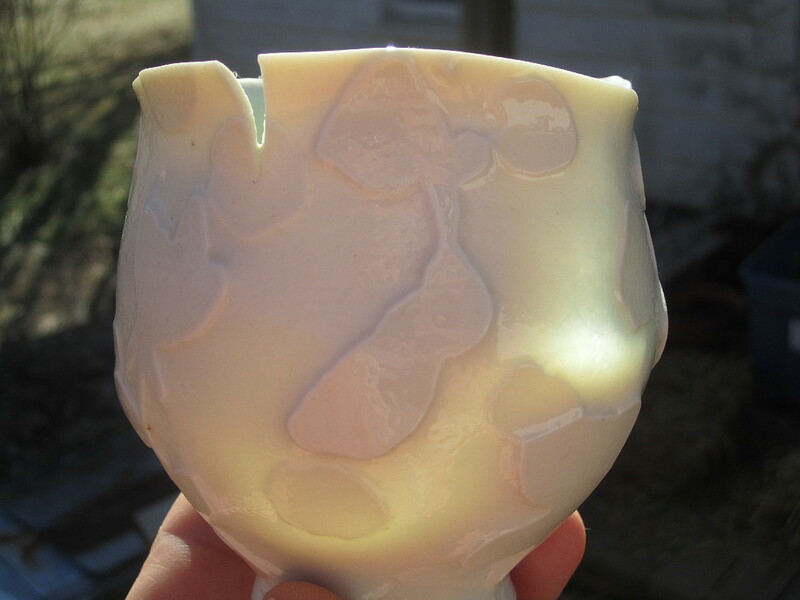 As you can see the edges stressed out from all the handling and cracked in the firing. This was common. The process was extremely time consuming, but I didn't mind that. But my wrists were suffering from all of the very careful handling of the constantly thinning pots, not to mention a chronic stiff neck. Then there was the frustration of actually going through the clay wall. And then there was the almost impossible way to photograph these pieces for the record. So this chapter in my career was closed about a year later. But like all good stories, it's worth telling again. I have a new can of shellac and I'm preparing to use it on some of the pots I've been making in the last few weeks. I'm even going to try it on some swirl ware! For those of you keeping score, this piece was fired in the salt kiln at the Barns at Penland and it is lined with my 1% Copper glaze. Fired to cone 10. OK, back to this wonderful Saturday afternoon of porcelain pottery making. I've just getting around to using my Matt and Dave porcelain that they were so kind to send me last summer! I'll let you know what I make with that! So far it's been really nice! Thanks M & D! Hope you have a great weekend, too! Did you make your 12 today? One advantage of working late is that there is still wood in the stove by morning. I filled up the stove and dampered it down for the night and strolled down to the house through crunchy frozen grass where rain turned to snow late in the day. 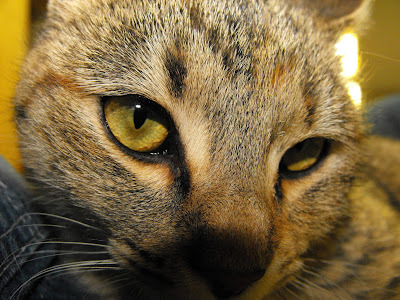 I managed to save those thoughts in my sleepy head for this morning's post. Maybe I just dreamed them? 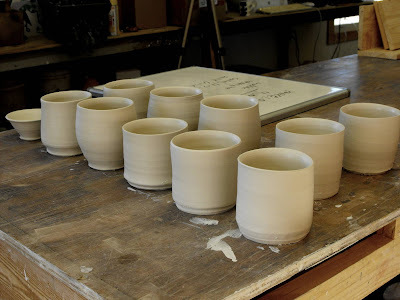 My schedule has been diced up by frequent snow days and kids at home, but I managed to get more porcelain pots made for my upcoming eKiln firing. 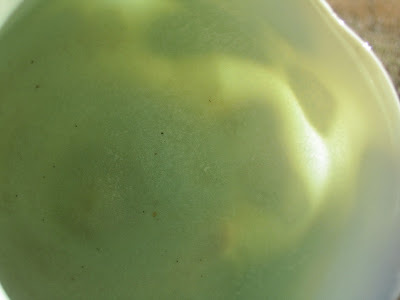 I'm researching some glazes to test and need to mix up some of those tests in the next day or so. Is it my reaction to the porcelain's fineness or is it the porcelain's desire or property prompting me to want to make these pots as thin as I can? I'm enjoying the throwing lines that you get when the clay wall gets too thin. 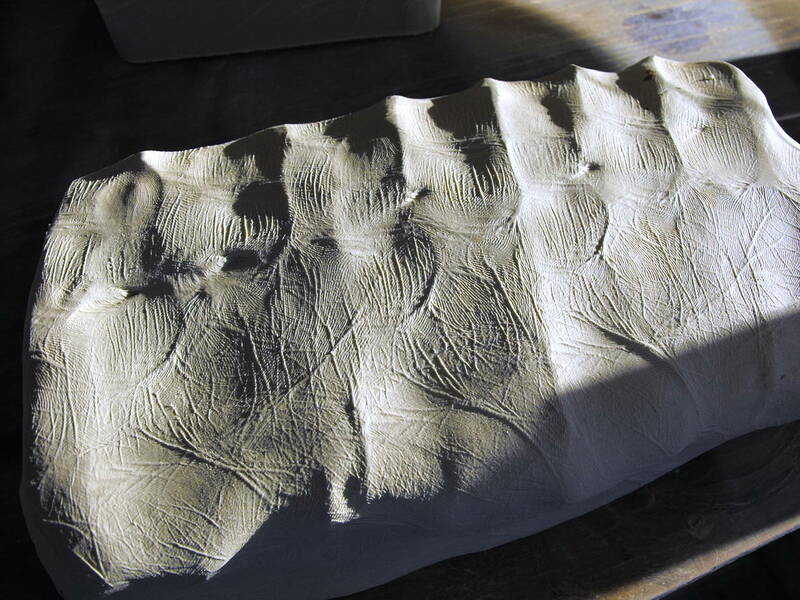 In my stoneware pots I avoid them vigorously with lots of ribbing. Also, I have an attitude about the home clay that it shouldn't be so thin, aka potato chip thin, aka being cheap with the clay. These are all clichés, right? Who knows? Certainly not me! I'm just trying to count chickens. Isn't that the crux of pottery making? 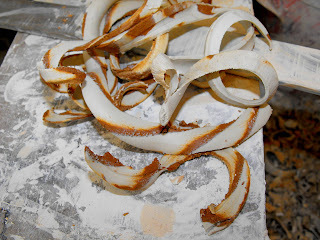 "Wait for it, wait for it...."
The kiln will be the teacher. Working with S & B was a blast and I can't wait to see how their crystalline glazes look on their surfaces that I painted. We'll try to continue the narrative with additional videos and stills. If these pots are successful in the end we will have a special online sale. So stay tuned for all of that. If you would like to view this video in HD (high definition), click on the youtube button at the bottom of the video window to watch on youtube proper and then check the button that either says HQ or 360p, etc. It takes a lot of bandwidth in HD and may be a little choppy depending on your connection. Also, the sound didn't seem to upload (at least not on my computer?? so don't try to adjust volume), sorry. If you have any questions, just leave a comment and I'll get right back to you. 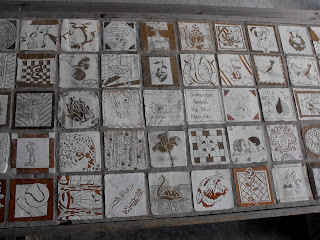 As alluded to in my post from the other day, I made my quarterly visit to Seagrove, the "cousins", and the NC Pottery Center. As I close in on my first year as a board member at the Pottery Center Jennie Keatts and I went around the center taking pictures for the NCPC Facebook page. Jennie and I also got together to brainstorm about the Pottery Center's online mission before the BOD meeting. 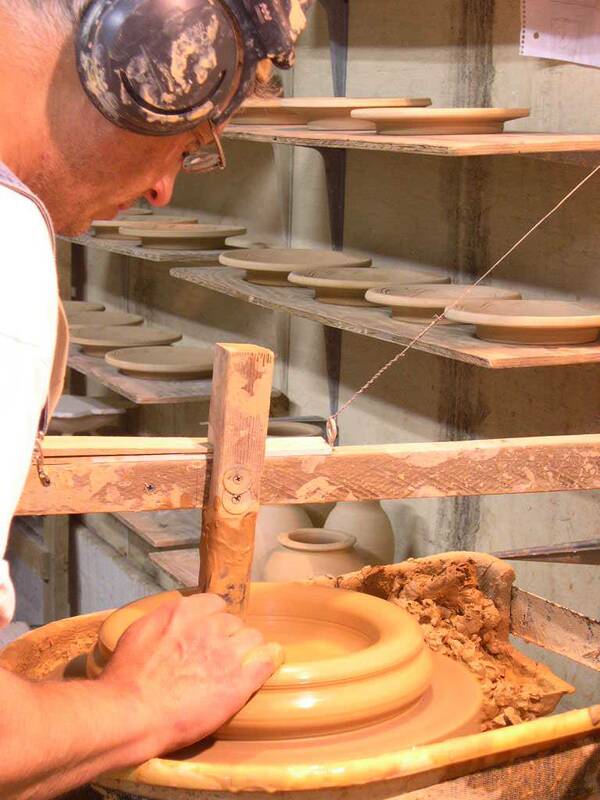 It's a place of great pride that we have our own pottery center in NC and the Center is always looking for ways to brag on our traditions and our future of NC potters. The NCPC is located in the heart of Seagrove North Carolina, and the grounds are a favorite spot for visitors to have picnics under the beautiful old oaks. 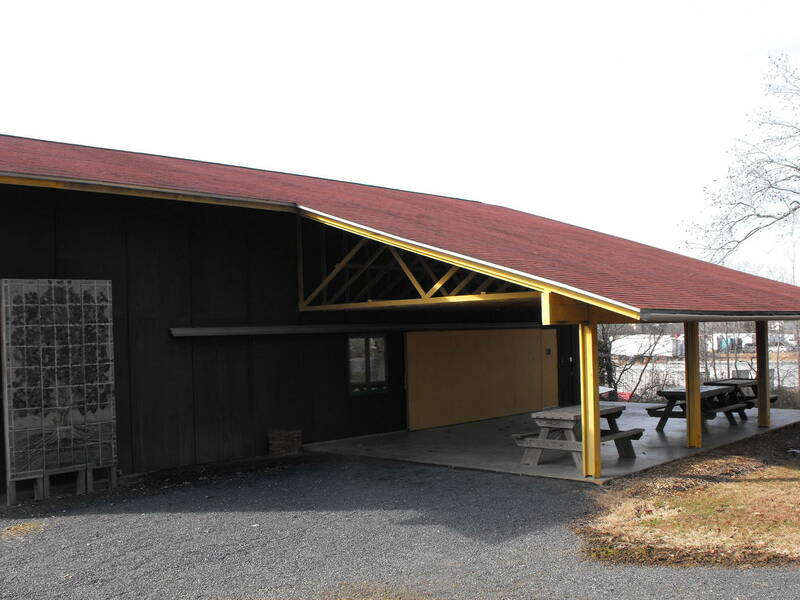 The NCPC was designed by NC architect Frank Harmon. 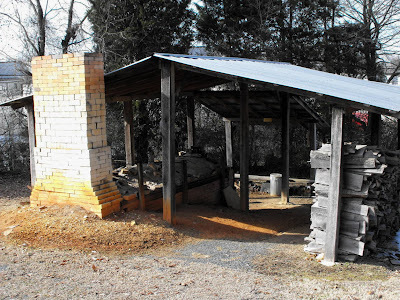 (Mr Harmon has also designed the Iron Studio at the Penland School!) The Education Building has a great covered outdoor space that is sometimes used for workshops. I've always loved the idea of working outside during fair weather. the "porch" at the Education Bldg. After my official business at the Center I went to stay for a couple of days at Bruce and Samantha's place south of Seagrove. We discussed plans for our upcoming "Cousins in Clay" sale in May, our Summer "Cousins in the Mountains" sale, and worked on some collaborations. It was a lot of fun, to say the least! I always get so much from my visits to their studio and seeing what they're working on. As I was decorating some of Samantha's yunomi, I realized that the shape that I had been making back in my shop were very similar to hers. Uh... Oh.... well I guess that's what "cousins" is all about. 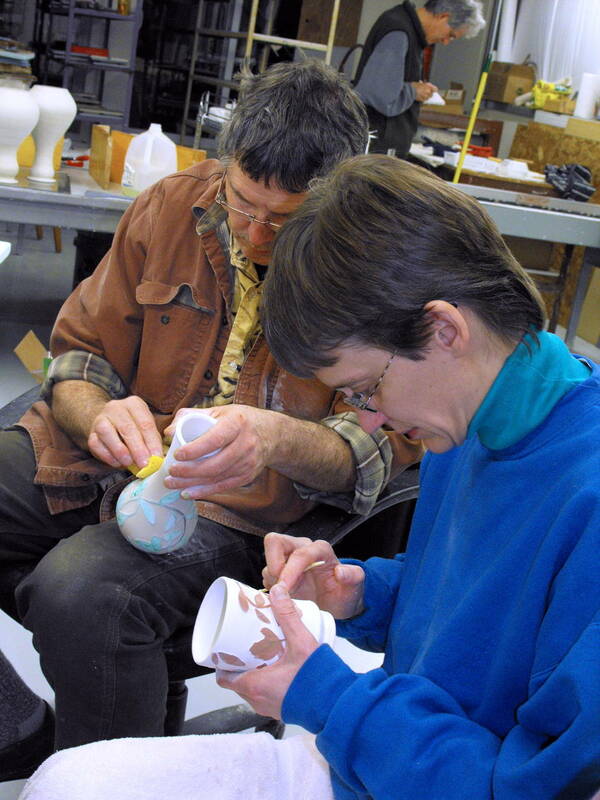 Bruce and Samantha working on some of the pots I painted with their special kind of polyurethane. closeup of Bruce hydro abrading! After two days and a lot of talking and brainstorming, we had about ten pieces done. I have some unedited HD video that I want to share. But I am finding out that all those hours of footage take hours to edit! Where is Buddy Squires and Ken Burns when you need them! We plan on taping all the various steps from these first stages all the way to their finishing touches! [Sigh/Phew] Someday! For now you can visit Samantha and Bruce's blog to read and see more pictures of our fun together last week! We'll announce a little sale of these pieces if they hatch from the kiln with all the splendor we are hoping for. So don't forget to check back the updates and if you don't want to take any chances, sign up for email announcements here. We'll be sure to let you know! Why aren't there more references to pottery in contemporary music? I just think clay is such an important issue. Paul Simon's "Slip Sliding Away"
Naughty by Nature’s "(Who's Down with ) O.P.P. yeah Yunomi"
Perhaps you just need to try listening with clay in your ears. Despite my partners and my best efforts I am still having trouble “getting it up” if you know what I mean. Do you have any suggestions? -Laying Down on the Job. I do have some suggestions. Have you tried adding grog, or even sand? Sometimes a little more grit can offer a lot of vertical strength. It may be simply that your clay is too short. I suggest you try playing with your ball clays, sometimes this can help a lot. Some folks suggest hand-building is the quickest way to create a large erection, but if you ask me, I wouldn’t obsess about the size of your cylinder. Belief that a large pot is a good pot is a complete phalusy. For a lot of men this can be a sensitive issue; I hope I wasn’t too hard on you. Remember It takes all kinds; woodfire potters often need to fire with soft wood as well as hard wood. 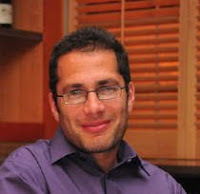 Simon Levin is a regular contributor to Sawdust and Dirt. He lives and makes pots in Gresham, WI. When Simon is not making or firing pots, fighting fires, or caring for his lovely family, he is creating such wonders as WikiClay! 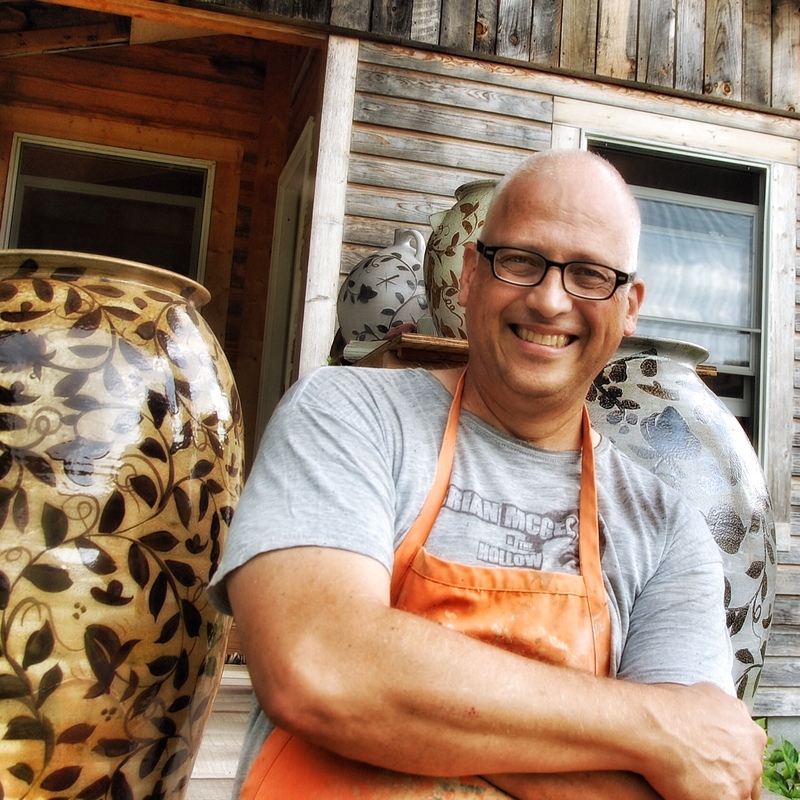 To find out more about Simon Levin and his pottery go to woodfire.com. If you have questions for Simon he can be reached at simon@sawdustanddirt.com otherwise please leave comments for Simon here! I have two good friends named Mark, both whom make enviable pots. One of the Marks has a show at the Ogden Museum that opened last week. 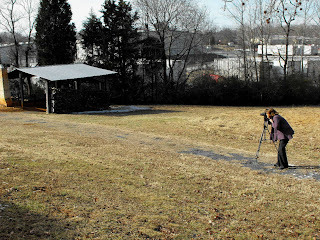 And the other Mark is coming to Asheville and Black Mountain soon to open the Karen Karnes show at the Asheville Art Museum. 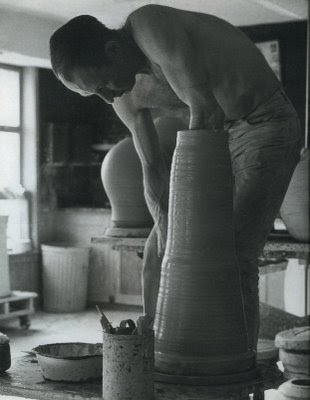 About his pots, Hewitt says, " they break new ground while tipping their caps to the great jugs and jars from the potent pottery tradition of the South; and, while delightfully big-assed, they are also profoundly big-hearted." You might see candy canes but I see bacon. Maybe I was hungry when I decided to pause to take this picture? But it hints at what I've been thinking about as I look over the calendar and plan out my year, my firings, and our income for the year. It's been a busy week and not much blogging has occurred here. I knew it was bad when Stacey pointed out that I hadn't posted in over a week! Yikes, crack that whip! So where is that horse I'm supposed to get back on, anyway? I guess, at the moment, I'm staring into my headlights (read: computer monitor) and don't know quite which way to post. The stories seem too numerous, so this will be my kick in the pants post and hopefully I will gather thoughts to share my visit to the cousins in Seagrove this week and some of the fun stuff we did, (we shot lots of video with Evelyn's HD Flip video camera, which cost me 5 bucks to rent, btw), an uplifting quarterly board meeting at the NC Pottery Center, and of course there is the continuing and uplifting saga of my porcelain experiment to update you all on. I have a lot of announcements to make, too [which I will dole out a little at a time so I don't come off sounding like one of those annoying arts calendar PSA's that start to sound like Charlie Brown's teacher after about 15 seconds]. In the meantime, while I dream of future-soon-to-be blog posts, can you guess which came first in the swirl cups above? In other words, are these red-dirt-clay with porcelain swirls? 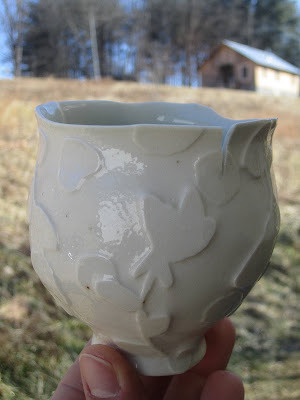 or, porcelain-clay with red dirt swirls? The secret will be revealed to you on Saturday. Here is the winning entry for Kline Pottery's first ever info-mercial! 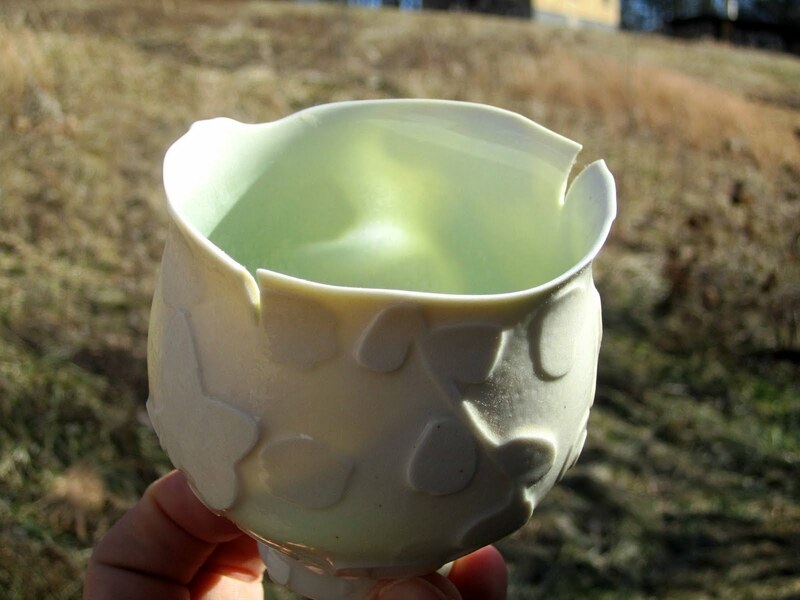 Joe Arnold and Katrina Plato of Bakersville, NC put this fantastic homage to the breakfast cup together! Now I hope I can keep up with all the orders that are going to flood in as soon as it gets aired on our local cable station! Thanks Joe and Katrina. Let me know when you all need some more Breakfast cups!! At this point I can't tell if it's the clay, or the tools, or the potter. But it's been a pretty frustrating go of the porcelain experiment today (and tonight). It's always easy to blame the clay, or the wheel when one stews in frustration, and it may be those things and more, but I can guarantee that inexperience is usually the player. Each pot and session in the studio is another chance to get it right when getting it right is the muse. They can be the reset button that hopes to build on previous success or right the wrongs of failures. We go round and round and hope that the next one will be better than all the others. Hope becomes determination. For tonight I'll have to accept that it's all part of the craft and the risk of exploring new territory and hope that the road I'm on will get me where I want to go. Another snow day here! Kids home from school, one with a fever, another sneezing! While Stacey worked at her jewelry in her jewelry shack, I scrambled to sort clothes, clean the kitchen, and enter a blog post. I guess you know where my priorities ended up. I've been looking to replace my wireless headphones after hearing about 50cent unveiled his new ones at CES last week. It reminded me how much I enjoyed my Sony headset until they crapped out last year. Some of you who read this post back a couple of years ago probably thought that my Shimpo Scream was really so loud that I needed ear protection. Well it's pretty loud but not that loud. But the headphones do help me hear the radio or podcast convo! If you have a favorite wireless headphone, chime in. And if you're reading this Mr. 50 cent, I'd be happy to do a review of your spanking new headset. I'm sure they're better than Dre's! Meanwhile we're off to see Ms. Lauryn Hill tonight in Asheville at the Orange Peel. I'm planning on asking her if she is coming out with any audio equipment I could review for her. ;-) Unfortunately our buddies who were going to the show with us can't make it. So if you have the "do re mi", we may still have a couple of tix. Just drop it like it's hot with an email to moi! Here is my friend and neighbor, Joe Arnold, from up on the Roan making a fine Udu drum. I guess a lot of folks got a flip video camera for Christmas, including Evelyn! Here's a little pottery review I made before dinner last night. I can't guarentee there will be more videos here on the blog, but if I can get someone to do voice overs or if I don't have to speak I will be more motivated. It's sort of like hearing your OGM on your voicemail. Weird. Today is a snow day and I plan on getting the girls involved in a photo shoot up in the studio! 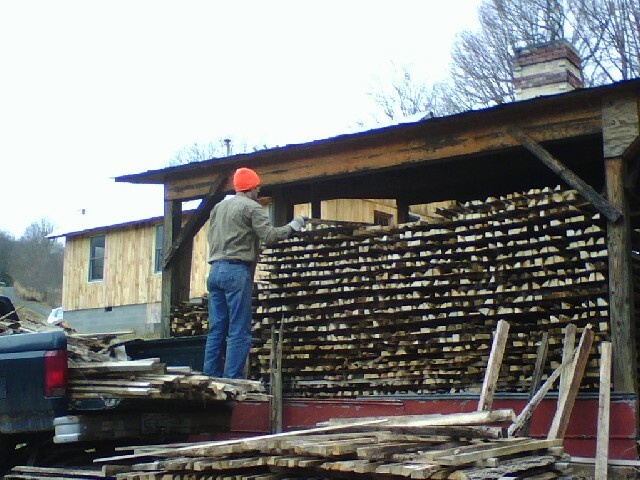 Here's John Simmons making a beautiful stack and standing on the truck bed to reach to top row. This is more than we will need for the firing in February but it forms a nice wall to the elements. There's never too much wood! I hope that this will be the last numerical cliche I will use this year, but I kind of doubt that I will be able to show such restraint. But this blog had to restart somewhere after a successful, restful holiday without blogging! So, why make 12 by 12 when you can do 11 by 11 in '11? The sharply pointed winter light of the morning combined with the whiteness of this clay made it very difficult to work with my shades, but I fought through the visual pain of seeing/not seeing. 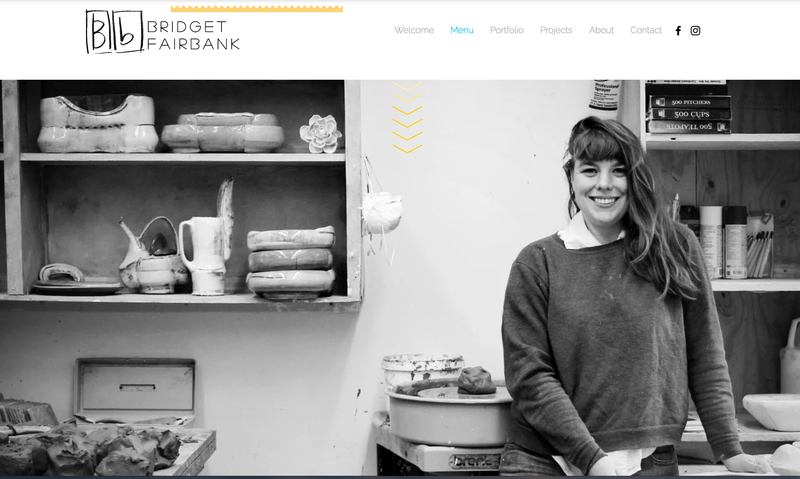 The clay is good, the hands a little forgetful, and the eyes squinting. That's how I began the first Monday of the year. More thoughts and ramblings will follow, but there are more pots to make today and I hope you will be along for the ride.